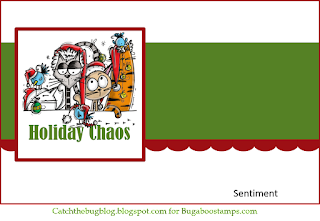 Dido's Designs: Christmas Chaos at Bugaboo!!! Today Im here with a wee card as Im taking part in some of the Christmas Chaos over at Bugaboo!!! I followed Day 2s Sketch for this card. Love the wee image. What a cutie!!! Im off to reheat. Well Ive been trying to cosy up for 2 hours now but now Im gonna sit on the radiator!!! Im freezing. Only drawback of loosing loads of weight is I always feel cold!!! Send A Smile for Kids - Winter Fun. Holly Jolly Challenge - Create a Christmas Card. Your card is adorable - I love the stitching! Thanks for joining our Bugaboo Holiday Chaos event this week - I hope you come back every day. Hope you are feeling bit warmer today hun! 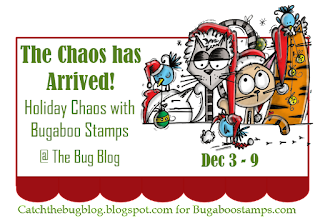 Thanks so much for joining us for the Bugaboo Stamps/Catch The Bug Holiday Chaos Celebration!! We hope you'll join us again for this weeks challenges, both our Saturday challenge and our Stella Says Sketch challenge! Lovely creation. Thanks for joining us at Holly Jolly. Good luck.